languagehat.com : It Made Most Sense in Greek. It Made Most Sense in Greek. It is impossible to characterize these conflicts accurately in a few words, for the theology at issue is amazingly intricate, depending on tight definitions and Platonist philosophical developments of concepts which would take many pages to set out in English (it was, furthermore, a debate which made most sense in Greek even then; Leo I was the last Latin-speaker really to grasp and contribute to it). Such detailed characterizations do not belong here. But it is important to stress that they did matter. Pagan observers found these debates ridiculous, even insane, as well as amazingly badly behaved, but having an accurate and universally agreed definition of God became increasingly important for Christians between 300 and 550, not least because the political power of bishops steadily increased. It is relevant that they mattered more in the East, where technical philosophical debate was longer-rooted in intellectual life, but with the ‘barbarian’ conquests Christological issues came to the West as well, and Arian- Catholic debates were bitter there, too; anyway, the Augustinian problematic which dominated theology in the West, centred on predestination and divine grace, was no less complex, even though it sidestepped Christological debate. It is of course impossible to say how many people properly understood the issues at stake at, say, Chalcedon; perhaps only a few hundred, although one should not underestimate the theological sophistication of the citizens of the great cities, exposed as they were to the sermons of some high-powered thinkers. But the problem of the real divinity of a human god, who had even died, at the Crucifixion, was at least an issue that would have made sense in the late Roman world, where the cult of the emperors as gods was still remembered (indeed, it was still practised by some) and the divine being was not, in the fifth century at least, as distant from humanity as he (or they) would be in some versions of Christianity. It is all too easy to make fun of the subtle distinctions insisted on by the various factions (I’ve certainly done so); he does a good job of explaining why they were seen as important. And in the next paragraph he mentions the Circumcellions (“ascetic peasants or seasonal labourers”)! He calls them the armed wing of the Donatists, and goes on to say “Monks from the countryside were also used as shock troops, usually on the Monophysite side; Jerusalem was a dangerous place because of the number of monasteries around it, which could quickly be mobilized…” Not the way we usually think of monks! Your comment on the monks made me think of the warrior monks of mediaeval Japan. I was about to link to the Wikipedia article on that (at Sōhei) but found that Warrior Monk had its own disambiguation page (Warrior Monk), so you can read about the various flavours of warrior monk in a few different civilisations. Yes, I thought of them too. It was a real shock to my system when I first learned about them in college: those sweet unworldly Buddhists, hacking each other up?! To anyone who might be thinking of buying the Kindle version: The book sounded interesting, so I followed your link to Amazon and bought the Kindle version. Unfortunately it doesn’t have any maps or illustrations. And even though it has Real Page Numbers, the Index of People and Places doesn’t have page numbers, or links back to the text. I guess one is supposed to use search to find the name in the text. Anyway, I returned it. Maybe my library has the hardcover. Tom Holland’s In the Shadow of the Sword covers some of the same period, and does delve a bit into some of the schisms because he recognises traits of some of them in early Islam. Michael Peppard’s The Son of God in the Roman World looks into how Christological debate was (maybe) shaped exactly by the cult of the divine emperor. I honeymooned in Chalcedon, Kadıköy these days; not as strong in its religion as are other parts of Istanbul, no trouble getting alcohol even if a mosque is close by. There are a few Armenian churches remaining, a token Protestant one and a large Catholic graveyard, but no Greek church I could see. Edsger Dijkstra, a Dutch computer scientist, commented once (and I can’t find the exact cite) that he wasn’t happy with the quality of an idea until he could express it clearly in both English and Dutch. That approach back then might have made for a more peaceful few hundred years! Huh, you’re right — I didn’t even notice. I have so many maps, usually better than the ones in modern books, that I don’t miss them, and I guess I don’t care that much about illustrations either, but I can see how it would bother people more visual than I. 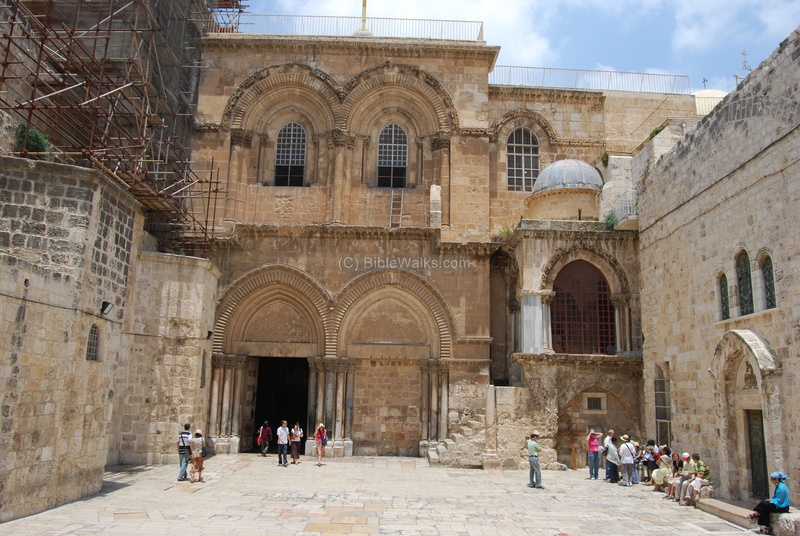 All photos of the exterior of the Church of the Holy Sepulcher show a ladder. It’s first mentioned in 1757. Apparently a fight breaks out among the priests of the various denominations if anybody tries to move it. See also the Wiki entry Immovable Ladder. I could have been clearer – it doesn’t have any of the maps and illustrations that are in the hardcover version. I feel cheated when content is dropped, usually without notice, in electronic versions. I agree, the illustrations are usually superfluous to the text, but I find maps are useful for showing places and territories important to the text without too much other detail. Ha! No problem, it’s not like you’re spoiling the plot for me. Sounds like a great read, thanks! Some choice Anglo-Saxon vocabulary, I would think. I think “extra” is a bit out of place here. What is Anglo-Saxon for “more”? I had to look up þeodcyninga. Thought it was some kind of depraved sexual act. That is the Marxist view. Wouldn’t that be þeodcyningum, anyway? Ha. Those weren’t matters of mere life or death. They were about eternity.